Descendants of John Riley Sr.
1. JOHN RILEY, SR. (EDWARD1) was born Abt. 1762 and died Abt. 1846 in Dale County, AL. The location of his birth is unknown but it is thought that he lived early in his life in Harford County, Maryland, and later in Orange County, North Carolina. He married MARY POLLY WHITAKER 30 Jun 1794 in Orange County , North Carolina, daughter of ABRAHAM WHITAKER and MARY PETTIT. She was born Abt. 1772 in Orange County, NC, and died Abt. 1859 in Dale County, AL. John and many of his offspring moved to Darlington District, SC, ca. 1815. The family then moved further south in about 1832 to southeast AL. 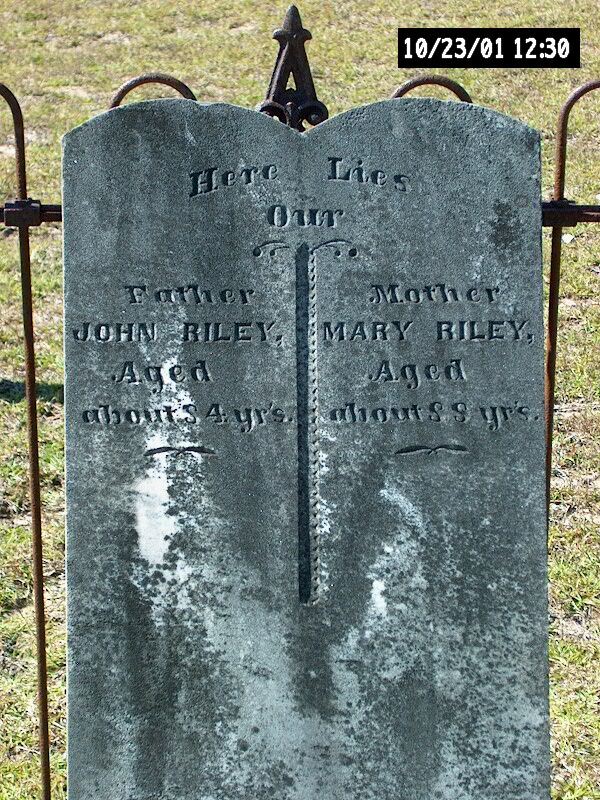 John died about 1845, and is buried at the cemetery at Old Center Methodist Church, in Henry County, AL- across the county line from Dale County. Many of John, Sr.'s descendants and relatives are also buried there. Detailed maps to the cemetery and photos of many of the headstones located there may be found elsewhere on this website. NOTE: There is a great deal of uncertainty regarding exact birthdates and order of birth of many of the children of John and Mary due to lack of records in the colonial and early American periods. The baseline genealogy data for John, Sr., and Mary Whitaker Riley was originally established by Robert Earl Woodham and refined by James H. Riley. i. JOHN RILEY, JR., b. ca. 1795, Orange County, North Carolina; d. Aft. 1840.
ii. WHITAKER RILEY, b. Abt. 1797, Orange County, North Carolina; d. Abt. 1845.
iii. NEEDHAM RILEY, b. Abt. 1799, , Orange County, North Carolina; d. Abt. 1865.
iv. EDWARD R. RILEY, SR, b. 22 Jun 1801, Orange County North Carolina; d. 15 May 1875, Dale County Alabama. v. ABRAHAM RILEY, b. Abt. 1803, Orange County North Carolina; d. 1865, Dale County Alabama. vi. WILLIAM MONROE RILEY, SR, b. 1804, Orange County North Carolina; d. 1885, Holmes County Florida. vii. DANIEL RILEY, b. 20 Jun 1809, Orange County North Carolina; d. 29 Jun 1897, Dale County, AL. viii. CARON H. RILEY, b. 1810, Orange County North Carolina; d. 16 Mar 1873; m. ARIS WOODHAM JR..
ix. ELENDER RILEY, b. Jul 1813, Orange County North Carolina; d. Jul 1895, Dale County, AL. x. JOANNA RILEY, b. 1814, Orange County North Carolina; d. 03 Apr 1890; m. EDWARD CHRISTOPHER WOODHAM. xi. MARY RILEY, b. 1815, Orange County North Carolina. xii. MOSES RILEY, b. Oct 1817, Darlington District, South Carolina; d. 20 Jan 1902, Alabama.